The new year is a time for reflection and renewal. Many Canadians across the country take this opportunity to think about what we can do differently this year, that can help lead us towards a happier life. Unfortunately, for many families living in developing countries, the chance for a fresh start never comes. Barriers like hunger, drought, and gender inequality can trap children and their parents in the cycle of poverty. Did you know that you can give the gift of a fresh, new start to a child’s family by making a donation today? Medina – a widowed grandmother and sole caretaker of her two young grandsons – knows what it feels like to need a fresh start. 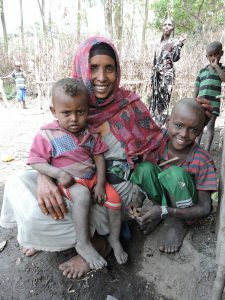 Medina used to live with her husband in the Eastern Amhara Region of Ethiopia, where he operated a small business that earned them just enough to survive. But one day, Medina’s husband died unexpectedly, and her life changed forever. To make matters even more difficult, she had also just become the sole provider for her two young grandsons – two-year-old Murad, and ten-year-old Alliy. Without her husband’s small business, Medina had no way to earn consistent income. She could barely keep her grandsons fed or clothed. Her neighbours helped them as much as they could – but as helpful as they wanted to be, they could not offer much. Medina’s home is a small hut built from wood and mud. It is one of a number of huts that are part of a small settlement of poor women and children that sits along a stretch of a main road. The roof is thatched, which does not protect the family well against wind or rain and requires continuous repair. Medina’s home has no electricity and no running water. There is good news. With a gift today you can help a family like Medina’s lift themselves out of poverty and give them the chance to change their lives. For Medina, her fresh start came as a rooster and chickens. Canadian Feed The Children’s local partner trained Medina on how to care for them and to raise them to lay eggs. “I took training on how to raise poultry. We learned how to build and clean their housing and we learned what to feed them,” she proudly explained. 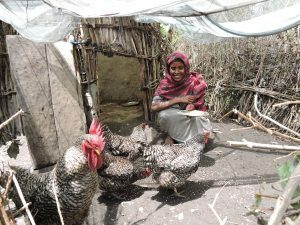 Thanks to the training and ongoing support she receives, Medina now knows how to keep the chickens healthy and safe. 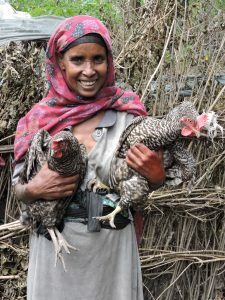 Over the last year her chickens have begun to lay eggs, which she sells at the local market to earn an income for her family. With his dreams of growing up to become a teacher, Medina knows that Alliy’s future could be very different from her own if she can continue to earn an income and keep him in school. “Since I started the poultry business, our life has gotten better,” she told us. Despite the vast improvements this past year, Medina and her grandsons are still very vulnerable. Medina will need continued support this year to grow her poultry business and work towards becoming independent. You can give children like Alliy and Murad, and guardians like their grandmother Medina the opportunity to work towards a more hopeful, happy future. Please join us in starting the new year by helping give families a chance for a fresh new start.